Mission Specialist Drew Feustel works outside the International Space Station, as seen in this view from the helmet camera of Mission Specialist Greg Chamitoff while they conduct the first spacewalk of the STS-134 mission on May 20, 2011 (Flight Day 5). This story was updated at 1:43 p.m. EDT. HOUSTON — Two Endeavour astronauts took a spacewalk Friday (May 20) to upgrade the International Space Station, but had to cut a bit of work short when a spacesuit sensor that detects carbon dioxide levels failed. The glitch occurred about five hours into the spacewalk, when a sensor that monitors the level of carbon dioxide inside Chamitoff's suit failed. Without this sensor, mission controllers had no way of knowing for sure how much oxygen he had left. The issue is thought to be the result of excess moisture in the sensor, lead spacewalk officer Allison Bolinger said in a post-spacewalk news briefing today. The moisture issue is not altogether uncommon, Bolinger said, and there are ways to monitor and test before the suit is used on another spacewalk. After detecting the glitch, NASA managers determined that there wouldn't be enough time for Chamitoff and Feustel to connect a series of cables, so Mission Control instructed the spacewalkers to clean up and call it a day early. "We made a more conservative estimate of the capability that Chamitoff had in his suit," lead flight director Derek Hassmann said in a post-spacewalk news briefing today. "We made the decision that we weren't going to continue with that portion of the task." The unfinished work will likely be added to the timeline of the mission's third spacewalk, Bolinger said, but those details still need to be worked out. While the spacewalkers were working, NASA continued investigating two small areas of damage on Endeavour's heat shield tiling. The damage will likely not pose any risk to the orbiter, but more analysis is needed to know for sure. Endeavour's STS-134 astronauts Drew Feustel and Greg Chamitoff conduct the first of four planned spacewalks on the outside of the Internaitonal Space Station. "Drew, I just wanted to say welcome back to open space, and Taz, congratulations on being the 201st human being to be in outer space," said their crewmate, Mike Fincke, from inside the space station. "I waited a long time to say those words to you." "It is a dream come true for me," Chamitoff replied. "It would be for anybody, the first or the 201st." "Welcome to space, buddy," Feustel said. The spacewalkers' main goal for the day was to remove samples from an experiment called MISSE (Materials International Space Station Experiment), which tests the reaction of different materials, such as paints, plastics, circuits and even seeds, in the environment of space. "A beautiful MISSE experiment," Feustel said upon arriving at the scene. Feustel and Chamitoff retrieved a set of samples that had been exposed to space for about a year, and stowed them in the shuttle's cargo bay to be returned to Earth for analysis. They replaced the samples with a fresh batch that will be left out for at least six months. "That is also another major mission objective milestone so congratulations," said Fincke, who was coaching the spacewalkers from inside the space station. The astronauts also installed a protective cover on a joint that controls the movement of one of the space station's solar arrays, and did some prep work for the mission's second spacewalk on Sunday (May 22), which will focus on topping off ammonia coolant in a leaking system. "Alright boys, keep up the good work," Fincke said after they had completed this task. "This is a lot of fun." One of their final tasks was to install a set of new communications antennas on the space station's Destiny laboratory. 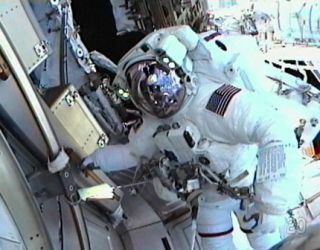 The spacewalkers were able to attach these successfully, but they were unable to install a set of connection cords because time ran out. Astronauts Drew Feustel and Greg Chamitoff conduct a variety of tasks on the exterior of the International Space Station. The duo performed the first of four planned spacewalks during Endeavour's 16-day mission. On Saturday (May 21), NASA may decide to schedule a focused inspection of the damaged areas on Endeavour's heat shield tiles so astronauts can gather more pictures for analysis. The astronauts on the space station will also have a phone call with Pope Benedict XVI from the Vatican. Two Italian astronauts — station crewmember Paolo Nespoli and shuttle astronaut Roberto Vittori — are currently in space. Endeavour's crew is in the midst of a 16-day mission to the space station to deliver a $2 billion astrophysics experiment and other supplies to the orbiting lab. Today's spacewalk officially lasted six hours, 19 minutes, bringing Feustel's total career spacewalking time so far to 27 hours, 17 minutes (Chamitoff now has a total of six hours, 19 minutes). It was the 115th spacewalk outside of the International Space Station's airlock, and the 156th spacewalk to build the space station. That brings the total spacewalking time spent constructing the station to 980 hours and 12 minutes.